Ice cream is always a good way to end a meal. But many times, ice cream itself is not enough to make dessert a completely satisfying experience. That is why we rely on other “supporting actors” in the form of… ice cream toppings! I have a lot of favorite toppings, and I don’t mind overloading my ice cream with toppings from time to time. For flavors on the chocolate side, I love marshmallows, chocolate chips and bits, chocolate syrup, cookie dough, and brownie bits among others. Nuts, too– almonds, pecans, walnuts, and hazelnut. For the fruit flavors, I love fruits that would complement the ice cream. For example, I love adding fresh strawberries to mango ice cream. Vanilla, is a different story all together. You can practically put anything. It’s a blank canvas. My philosophy for this is to just let your imagination, taste buds, and instincts do all the decision making and you’ll never go wrong. And the good thing: generally, toppings are very easy to find. In my recent trip to Singapore, I have to say I went gaga when I saw two delicious toppings, both of which are under the Reese’s brand of Hershey’s. Who doesn’t lo000ooove Reese’s? That is why I immediately bought the two products. I have yet to see them sold in Manila. They’re reasonably-priced too, with each product being sold at only 6 Singapore dollars each. That’s roughly P200 here in Manila or about US$4.80. Not bad. I give them a full stamp of approval. The first product: Reese’s Chocolate Peanut Butter Topping. I got to buy this at the Hershey’s chocolate store just outside Universal Studios in Sentosa. The product is almost self-explanatory. It’s a wonderful alternative or second option to those who have chocolate fudge every single week. It’s Reese’s chocolate in thick, syrupy form. It’s perfect for vanilla, and almost any chocolate-flavored ice cream. I love how the peanut butter flavor of the syrup contrasts with vanilla or chocolate and complements with them. 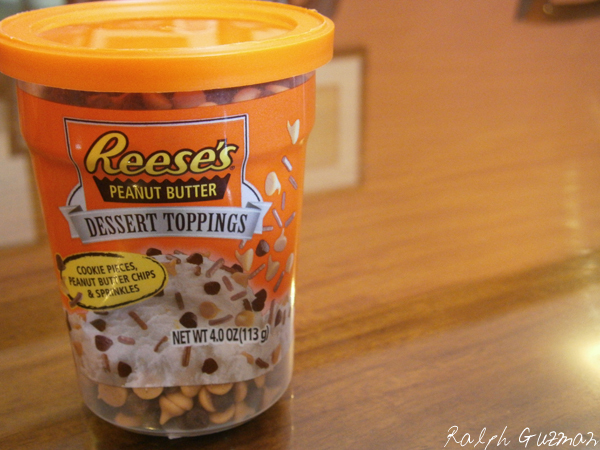 The second Reese’s ice cream topping is Reese’s Peanut Butter Dessert Toppings. I saw this product at the Candylicious store at the basement of ION Orchard Mall. It’s a jar of peanut butter heaven, thanks to the combination of cookie pieces, peanut butter chips, and sprinkles. 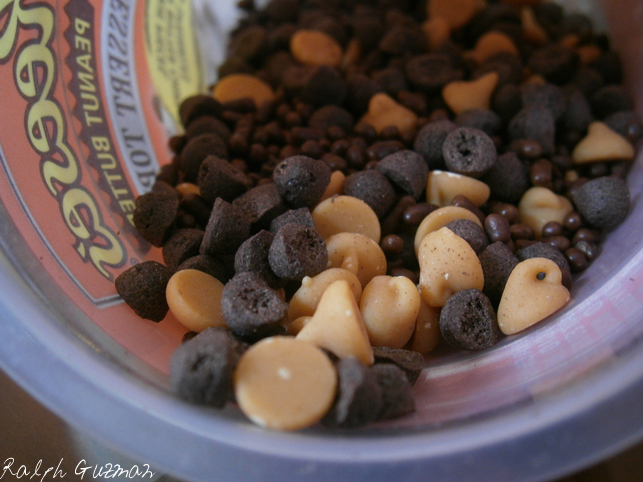 The peanut butter chips and chocolate sprinkles are very creamy. They melt in your mouth as you have your ice cream. Meanwhile, the cookie pieces add crunch, which I personally love the most. With the addition of marshmallows, I believe you’re all set. Here’s how it looks inside. 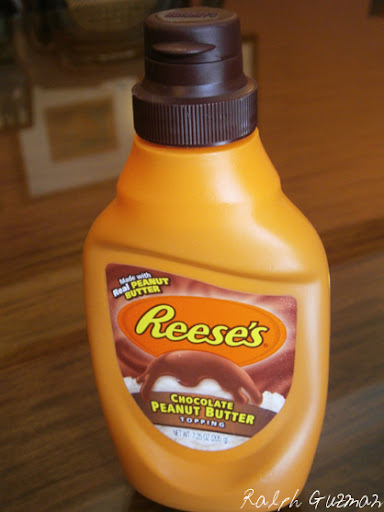 Of course, the use of these two Reese’s products is not limited to ice cream alone. 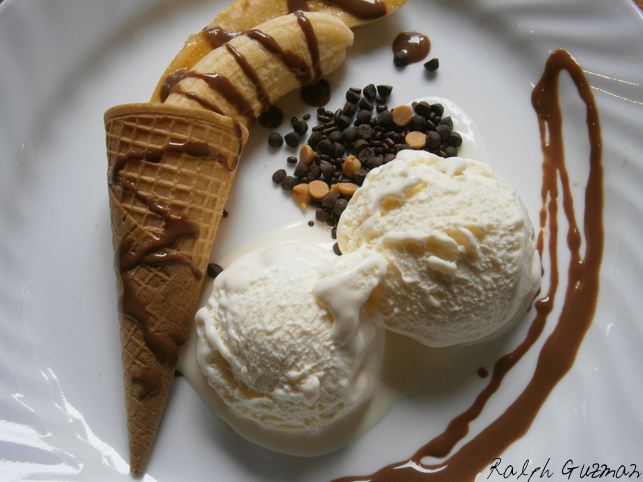 In fact, I used the dessert toppings on the Chocomilk Pancakes with Magnum Ice Cream, which I also made recently. I also have plead guilty to enjoying the dessert toppings in particular, as a treat on its own while watching TV or working at home. I enjoyed these treats one Saturday morning. As I could not wait for dinner, I had them at breakfast, using vanilla ice cream plus banana as an additional ingredient. I’m sure you will enjoy these treats too, as I enjoyed working with them and of course, eating them with loved ones! They’re Rated Delicious. This entry was posted in Rated by Ralph and tagged Dessert, Hershey's Reese's, ralph guzman, Rated Delicious, RatedRalph.com, Reese's, Reese's Chocolate Peanut Butter Topping, Reese's Peanut Butter Dessert Toppings, Reese's Peanut Butter Syrup by Ralph. Bookmark the permalink.